Much to-doings at the moment here at Knitting to Sane, on all fronts. I’m finally having to get down to brass tacks on term prep, as well as a move coming up next week. (Not far, and not requiring furniture, but enough to involve a relocation for the next several months). So there’s lots going on in progress let alone adding the knitting in, which means there is sort of a steady-state level of crazy. But I am telling myself everything will get done and that means it all will get done, right? Right. On the knitting front, my Lamplight shawl (previous posts) is close to release – it’ll be up at The Sweet Sheep soon, once Michelle has everything back up and running. She’s been a bit delayed coming back from maternity leave but never fear, when the pattern is available you’ll be the first to know! I finished the swatch. Most of the time, I finish the swatch. It makes me feel like I’ve gotten a mini accomplishment to work from. Swatches, you’re OK.
Love those swatches, they’re like mini works of art in their own right. Finishing them is the right move. Good luck with the move and everything else! Good luck with the move, I know what you mean about the crazy. I’m moving too (I’ll upstage you: with furniture and international), finishing my thesis (finally!) and haven’t even thought about what I’m going to teach. I manage to find time for the odd few stitches here or there, but nothing too complicated. How do you manage to get headspace for such beautiful swatches??? You are one busy woman! I can see where the knitting is keeping you sane. I’ve had a heck of a month so far too*, and well, I haven’t knit much, and am probably going to frog what I did do, but it helped wind my brain down several nights when it needed it. The swatches look yummy! Do you do anything with your finished swatches or just keep them around to fondle? *Nothing even as remotely interesting as moving, even slightly — just deadlines. Great swatches Glenna, do you keep track of needle size and fiber weight/content? 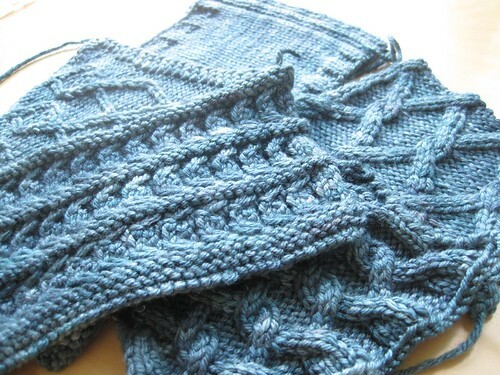 Great knitting weather here in northern Ontario..sunny with a breeze..
Yum – love your patterns and really looking forward to seeing the new cardi. The swatches look inspiring! And since my bank account now seems permanently linked to Kim’s I am thinking that this could be destiny, or serendipity, or ???? Those cables look divine. Good luck with the move.